After a break for the World Cup qualifiers, I’m sure most venues in the Premier League will be buzzing with anticipation this weekend. At the Amex Albion take on Albion as Brighton and Hove play West Brom. Amongst those in attendance will be Football Focus and a commentator who is set to call time on his career with BBC Sport. No not me, John Motson will start his farewell to holding the mic for the Beeb by providing highlights for Match of The Day. Fifty years is a very long time in any job and longevity is part of Motty’s success. Growing up he was certainly a figure I was aware of. I will be honest he’s not my favourite but has a special place in the emergence of football on television. He described some key moments such as Gazza’s tears and the Crazy Gang’s win over the Culture Club when Wimbledon beat Liverpool. You could go on but Motson was also part of an era when football was only available on a select few TV stations unlike today when there are more outlets than games John has commentated on. He was recognisable. The statuesque pose on the pitch in the snow wearing the sheepskin jacket is an image I will always remember. He was a key man behind the microphone when the public began to see the faces of the voices they had been listening to. Many would have recognised Motty’s chuckle but would they have known him if they bumped into him in the street? The television era changed all that and Motson like many others became a household name. This Saturday he will peer down on yet another match processing the action. Viewers of MOTD will no doubt get a glimpse during the highlights of him as he describes the game. Who knows what will happen? No one does. That’s the beauty of live sport. That’s the buzz for the commentator charged with relating it to the audience. I’m sure Motty will love every minute. He’s commentated on so many historic moments and he will be acutely aware that the Seagulls are yet to score their first Premier League goal. 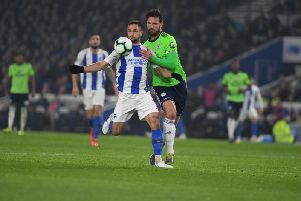 His arrival on the South Coast may just be the spark the Seagulls need to get their season up and running and make viewing on BBC One on Saturday night that bit sweeter for the Albion fans.